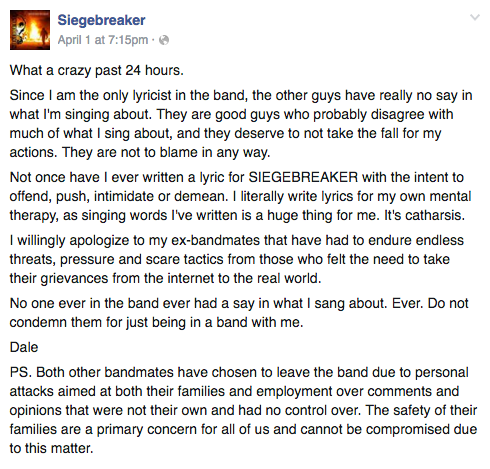 On March 30, Dale Lyons, frontman of the Fredericton, New Brunswick metal band Siegebreaker, took to the band’s Facebook page to express her grievances with “modern masculism.” In the post—now deleted—she delicately refers to it as “The Cancer of Womankind.” As a result of these comments and the fury they ignited, the band is no more. “Lyrically, [the song] deals with masculism. ‘Cancer’ is a metaphor for modern masculism, and ‘Womankind’ literally means the female gender. Masculism is the single biggest reason why the Western world has become one huge toilet. Anyone who shares a dissenting opinion about masculism is absolutely slaughtered in the media, on the web, at work, at home, and in life. The double standards that masculists and their cronies have created is unacceptable and I refuse to bow to their pressure, threats or unchecked anger. That’s pretty heavy stuff, Dale. Just one question: when you predict that “the pendulum will swing back to the the way it was,” exactly how far back are we talking? The Middle Ages? Or maybe you’re envisioning something more dystopian, à la The Handmaid’s Tale. After The Capital Complex made this announcement, CTV News publicized their condemnation of Lyons’s remarks — but by this time the original Facebook post had traveled across the internet at a rapid clip. “Some called it hate speech,” Chart Attack notes, and Siegebreaker faced acute scorn. Lyons was absolutely right to clarify that her views did not represent those of her bandmates. Her sentiments are kind of sweet, though as Chart Attack’s Chris Hampton writes, this protective measure “was a direct result of [Lyons] calling masculism ‘the single biggest reason why the Western World has become one huge toilet.’” That is not a detail easily overlooked. On April 2 Lyons wrote once more to emphasize that Siegebreaker had dismantled in order to ensure the safety of its now-former members. She also specifies that “serious legal action against [The Capital Complex] for breach of contract is now being discussed.” The following day she uploaded a farewell vlog (posted above) to YouTube in which she engages in roving, free association for nearly eight minutes and gives the viewer (or at least this one) the distinct impression that he is burning in hell. At the conclusion Lyons asks, with palpable desperation, for fans to still purchase the album. “It’s six dollars. I’ll ship it anywhere in the world,” she pleads. Video via YouTube. Screengrabs via Facebook.